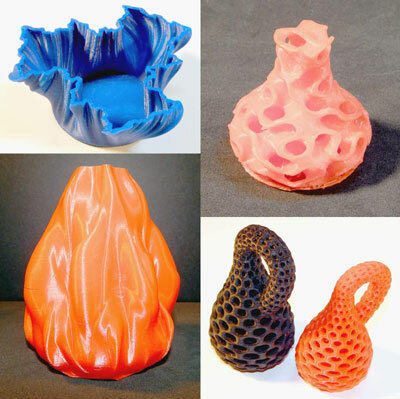 One of the magnificent aspects of 3D printing as a medium for artistic expression is that it allows very abstract ideas to be represented in solid form. Often difficult concepts become easier to understand than simple descriptions and flat photographs would allow. Mathematical models are amazingly detailed and fluid in their representation. Designs like those of Asher Namias and Stijn van der Linden can transform simple equations into elegant works of art. 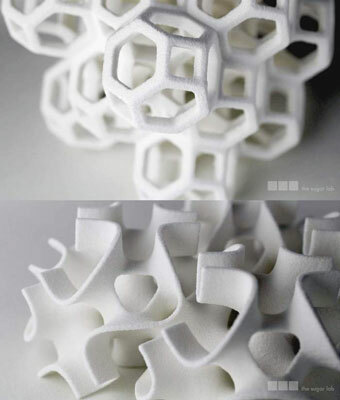 Mathematical models are also used by the Sugar Lab to create amazing edible creations formed from granular sugars. These are magnificent examples of new options available for personalization as additive manufacturing options for materials expand into new areas. Not only successful 3D printers but also even scrap filament left over from failed prints and discarded supports can become works of art. 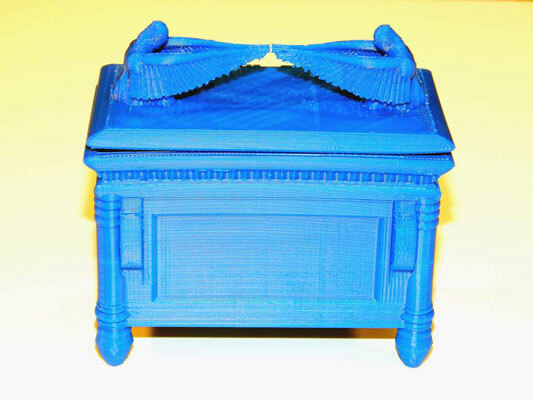 3D-printable objects that can be easily shared offer ways for artists to engage with the public in the creation of “crowdsourced” art such as the PrintToPeer effort created by artist Jeff de Boer. This Canadian artist is known for his 3D-printed designs inspired by armor such as chain, scale, and plate mail. He has created a site to facilitate his artwork, where individuals can create their own personalized scale designs and then print out copies to be shipped to the artist. Kirk created a design, which he then downloaded and printed using different colors and combinations of colors of plastic filament. These will be included in the final large artwork compiled from all contributors by Jeff de Boer, along with a few designed by Kirk’s children and students that they decided to print for themselves. The design is also available at Shapeways. After original patents for selective laser sintering expire in 2014, creating another hundred of these scales will not take weeks to print six at a time on the flat build plate, but instead can be accomplished in hours by printing stacks of them arranged horizontally within the three dimensional build volume. 3D-printed artistic creations and even business cards may become much more commonplace in the next few years as options for personalization provide a way to stand out from the crowd. Kirk hands out samples of 3D-printed materials whenever possible, which has encouraged others to contact him to find out more about additive manufacturing and his SOLID Learning educational program. The word is getting around. Art may also serve a purpose without losing its artistic value, so design whatever your ideas suggest and collect 3D models you enjoy. Print copies of these and hand them out whenever possible to spread the word about the changes that are coming through the expanding development of additive manufacturing in its various forms. If you want someone to call you for more information, simply include your name and contact information directly in the object you print. It costs no more to create an object with an “engraved” text message than it does to print the original solid object itself.